It has been estimated that one half of the world’s population, approximately 3.5 billion people on six continents, lives or works in buildings constructed of earth. Mud-brick dried in the sun, is an ancient structural system for building construction, and was being utilized at least 6,000 years ago along the Nile, Euphrates and Tigris Rivers, as well as other places throughout the world. It was used mainly in dry and arid areas due to the deterioration of the mud-brick caused by wet climates, hard rains, floods and earthquakes. Mud-brick homes are very dangerous. They are death traps in an earthquake, and deteriorate in wet climates. The fact that concrete construction survived the Elazig quake in Turkey in 2010 with little damage, served to highlight the inadequacy of mud-brick buildings. They should be demolished immediately, and new buildings that are resilient to earthquakes should be constructed. Adequate housing is a basic human need, yet the statistics of the United Nations Commission on Human Rights in 2005 notes that an estimated 100 million people… In 2005… live without shelter, or in unhealthy and unacceptable conditions. This is a growing problem. In addition, there is the problem of poor housing. Housing that will not survive storms, heavy rains, flooding or earthquakes. Today, estimates of the world’s homeless population plus those living in poor housing can reach a figure of ONE BILLION PEOPLE. Within the United Nations Millennium Development Goals, Target 4 of Goal 7 states, “…by 2020 to have achieved a significant improvement in the lives of at least 100 million slum dwellers.” The first step in accomplishing these goals is to provide safe and decent housing accommodations. A decent home to live in provides the basis for the solution to all of the other social problems facing the homeless population. Possessing a stable and rugged home to live in gives a person or a family security, hope, drive, determination, self-worth and value. It provides a reason and purpose for being. It provides a sanctuary from which they may begin to create dreams and goals for which they will set out to accomplish. This is what a home gives to a person… much more than just shelter from the cold, the rain and the sun. A home gives a person something more to live for than just survival. With permanent housing, GHP participants can begin to reclaim the self-confidence and control over their lives which was lost as a result of becoming homeless. Homeless families are more responsive to interventions and social services support when they are in their own homes. Global Housing Partners addresses these urgent needs, and provides a simple and economical low-cost, low-tech Construction System, to qualified partners and willing participants, that satisfies the requirements for building a rugged climate and earthquake resilient , “do-it-yourself” home for the global village. 1 - It can’t be done. 2 - It probably can be done, but it’s not worth doing. Khalil Gibran once said…”The obvious is that which is never seen until someone expresses it simply”. 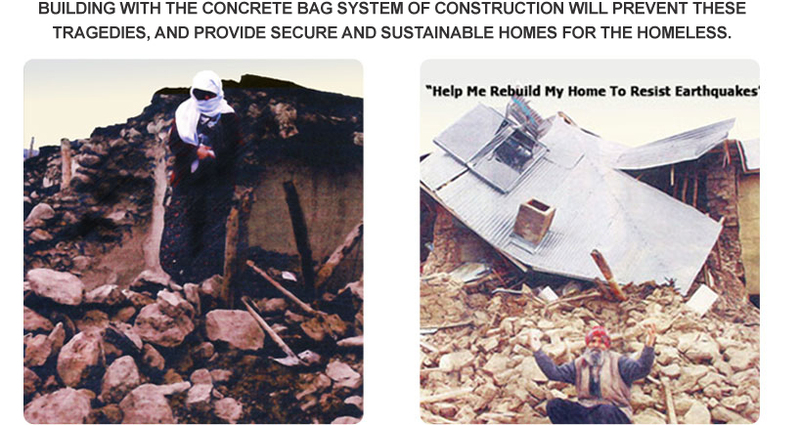 Global Housing Partners is providing this “simply obvious, good idea”, of concrete bag Construction to help solve the housing crisis for the poor and homeless of our society.